DreamFoil Creations has posted the first picture from the upcoming Aerospatiale AS350 Ecureuil for X-Plane 10. REX Game Studios has posted this in-game sound preview from the upcoming REX Essential for Real Environment Xtreme. McPhat Studios has posted previews from the PMDG Boeing 747 World Airliners 4 - Japan Airlines HD Textures. The freeware weather add-on FSrealWX for FSX and FS2004 has been updated to development version 1.03.1340. Dan Klaue has posted the first preview picture of the panel from the Quest Kodiak project in the X-Plane.org Forums. The recently released Alabeo Sukhoi Su-26 for FSX is now also available to purchase at SimMarket. - Get Free Liveries after you buy it! Pacific Islands Simulation Puerto Vallarta Intl. Airport (MMPR) for FSX is now available with a 30% discount at PC Aviator. VOZ Sydney Airport (YSSY) Version 2.3 Update for FS2004 is now available to download at the OZx Website. McPhat Studios has posted previews from the PMDG Boeing 747 World Airliners 4 - KLM (Old Colours) HD Textures. Dino Cattaneo has posted this external weapons preview from the Lockheed Martin F-35A project for FSX. Carenado has posted several new livery previews from the upcoming Cessna CT182T Skylane G1000 for FSX. Baja Sim has announced development of the ATC4Real ATC Simulator. Try the beta version at the ATC4Real Website. AVSIM has announced the $1000 15th Anniversary Essay Contest. Entry deadline is 5:00 P.M. March 31st 2012. Aerosoft is offering 20% discounts on select sceneries during the VFR Weekend Sale. Ends Monday, March 5th 2012. A2A Simulations has posted more previews from the upcoming Accu-Sim North American P-51 Mustang for FSX. Flight! Magazine - Issue 03 2012 (german language only) is now available to purchase at SimMarket. TropicalSim has released Washington National Airport (KDCA) for FSX and FS2004. Now available at SimMarket. New preview screenshots have been posted from the upcoming Digital Combat Simulation (DCS) P-51D Mustang. Several Outerra versus Real World comparison screenshots have been posted in the Outerra Forums. McPhat Studios has posted previews from the PMDG Boeing 747 World Airliners 4 - Singapore Airlines HD Textures. McPhat Studios has posted previews from the PMDG Boeing 747 World Airliners 4 - All Nippon Airways HD Textures. 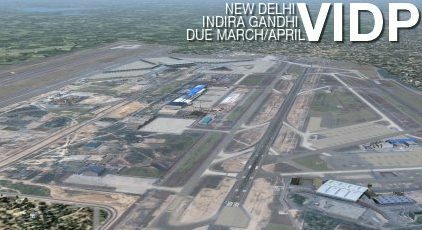 ImagineSim has posted a March/April 2012 released date and picture for Indira Gandhi International Airport (VIDP). Eaglesoft Development Group is offering 10% off with use of the March Madness Sale Coupon. Expires March 31st 2012. The freeware weather add-on FSrealWX for FSX and FS2004 has been updated to development version 1.03.1337. Aerosoft has posted the first preview pictures from the upcoming Amsterdam Airport Schiphol (EHAM) for X-Plane 10. Aerosoft has released the FSX version of Frankfurt-Hahn Airport (EDFH). Now available at Aerosoft and SimMarket. The freeware Soko J-20 Kraguj for FSX and FS2004 by Tim Conrad is now available to download at Rikoooo. SoulMade Simulations has posted texture map previews from the upcoming de Havilland DHC-2 Beaver for X-Plane. TropicalSim has posted final previews from the upcoming Washington National Airport (KDCA) for FSX and FS2004. Simbreeze has released Heraklion International Airport (LGIR) for FSX (FS2004 version soon). Available at SimMarket. Orbx is holding the March 2012 NZSI Screenshot Contest to win the Southern Cross Flight Panels - SCP102 Panel. Freeware Expansion Packs to LimeSim Aerosoft Antarctica X for FSX have been posted at the LimeSim Webpage. McPhat Studios has posted previews from the PMDG Boeing 747 World Airliners 4 - Garuda Indonesia HD Textures. The IRIS Simulations McDonnell Douglas F-15E Strike Eagle for FSX - 24 Hour Sale is still available at SimMarket. FSGenesis is now offering 70% off everything at the FSGenesis Online Store. Valid today February 29th 2012 only. Black Box Simulation has posted this VC preview picture from the PSS Airbus Professional 'Remastered' for FSX. Microsoft Flight has been released and is now available as a free download at the Microsoft Flight Website. Blue Sky Scenery has released the freeware Channel Islands National Park, San Nicolas NOLF (KNSI) photo scenery. The freeware Figueira dos Cavaleiros (LPFC) scenery for X-Plane is now available to download at the XPFR Website. ST Design has released the freeware Bony and Per Airport (LHPR) VFR scenery. Download at Flightsim.com. ST Design has released the freeware Nagykanizsa Airport (LHNK) VFR scenery. Download at Flightsim.com. DreamFoil Creations and Nemeth Designs appear to be collaborating on a yet unspecified project for X-Plane 10.